I have some new colors in my palette that is resulting in creating unusually colorful paintings. Here is a painting of some old shoes, done at Suhita's place. Just a little swish-swashing for today. Nothing too crazy but i enjoyed playing with some new colors - cobalt teal, peacock blue etc. Whatever, it is a daily painting anyway. Sometimes when I am low on inspiration and emotional energy it is hard for me to paint anything original. In times like these sometimes it helps to not challenge myself too much and just do something simple and manageable. I flip through my art books, pick a simple sketch or painting and make a quick copy. Here is one such from Edward Norton Ward's book First Impressions. Things have been a little rough in my personal life this past week due to illness of a beloved family member, and it was kind of hard to get into the headspace of painting. I am not going to beat myself up about missing a week of painting and just get rigjt back on the horse. Today I did a few exercises from Catherine Gill's book Powerful Watercolor Landscapes. Here is one which is a copy of one of her 'demo' paintings from the book. More rendering practice today. Learning a thing or two about using the thinner vs linseed oil. I can't wait to figure this out so I can make these paintings my own, and not just worry about technique. Oh the wait! Here's one from this morning. There was a bunch of junk food from last night's boardgaming session lying around the living room, so I thought why not try it. It was challenging, but so fun! I am still trying to get a hang of how to apply the paint, how to organize my colors on my palette and which brushes to use for what purpose etc. It is going to be a long process, but I have a good start I think. 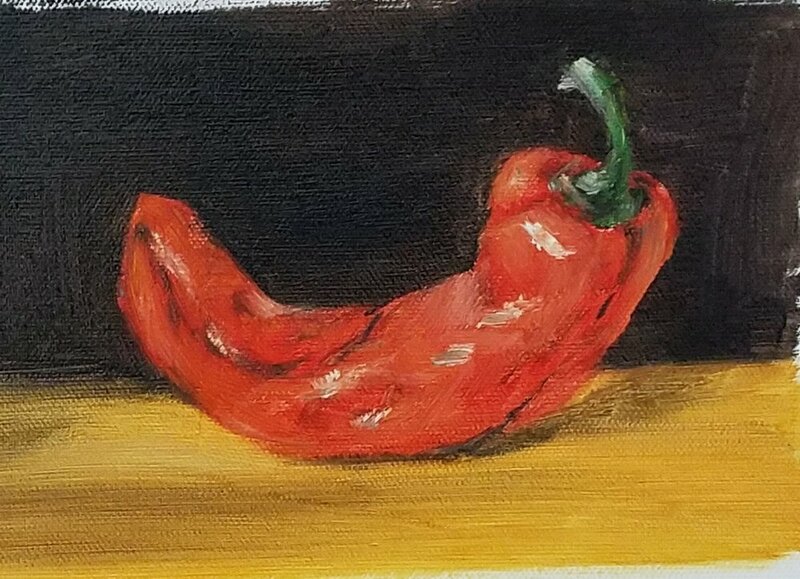 Today I did some rendering practice in oil. I was using the canson xl pad so far, and having a lot of trouble with it. I see to be picking up more paint than I was laying down. My frederik canvas pad arrived today so I thought I will try that and see if it makes any difference, and it did! I was able to control the blending a bit better. It is still very early days of course but better than my efforts so far. Okay this one is absolutely no good, but here it is for full disclosure. I continue to have trouble painting in the 11x14 size, but I will never get there if I don't keep trying. Although this crop is not so bad. Today I returned to my first love, watercolor. I chose to work from a picture of these cute sheep taken by an artist friend. I really liked the strong light and shadow in it. I have never painted sheep before, but there is a first for everything right? I am not crazy about the rocks, and about the awful marks in the water. These are the things I might focus on next time. I lost a few of my brushes in the recent travels, and the lack of flat brishes made it difficult to add the crisp shadow edges in the rock faces. I might have to remedy that soon. I enjoyed planning in layers, which I rarely ever do. I started with a yellow ochre wash over almost every thing other than the highlights on the sheep. When that is reasonably dry I painted the greens, followed by the shadows in the rocks and the sheep. I then deepened the rock shadows and painted the dark water. I will have to try this again and learn from the mistakes from today. This is my first oil painting but in so many ways it is informed by my watercolor painting. In so many ways art is just art, the techniques may vary but what works in one medium works in others. I worked from a picture for this one, and since I am still learning how this medium works, my goal was not to make a realistic rendition. I was more interested in making the painting look interesting despite my lack of skill with the techniques. I feel that i was able to achieve that in this study. And considering this is my first oil painting ever, I am really kind of proud of it. Okay granted this is not a painting, but it is a big deal for me. I have wondered what oil painting was like since forever, and finally had the courage to try it today. I just have cheap student quality stuff on me right now. I loved the experience enough that I placed a BIG order on blick for oil paints. Today's painting is a further exploration of the casein medium. I do see progress from yesterday. One thing I found is that it always looks horrible in the beginning and even midway through, but slowly things start pulling together. So don't give up before adding shadows and highlights. Today's study is a copy of one of Carol Marine's daily paintings. What attracted me to her paintings are the unusual compositions that make everyday subjects interesting. I am told that I am a timid composer, which is true, and that is why I am trying to learn from people who do things very differently. I, then, wanted to experiment with what casein would do on a mid tone surface, so I picked a piece of scrap chipboard to practice on. I like that I don't have to worry about eliminating the white of the paper, and that any white is intentional white. I had a set of Casein paints sitting in my shelf for a few months now. I bought them when James Gurney released his Casein in the Wild video. I never got a chance to play with them simce then, things were a little too hectic to get started with a new medium. We kept this long weekend free of all activities, so I got a chance to break open the new set, get a palette prepped, setup a simple still life and just have a go at it. After many weeks (or is it months?) of crazy work and travel schedule I am happy to be back to painting again. At this point, being staved of art for so long, I am ready paint like a mad person and also I like challenges. I was reading Carole Marine's book on daily painting and that gave me the idea to try it myself. Good or bad, small or big, do a painting everyday and share it here - this is what I hae challenged myself. Today's painting is a copy of Hazel Soan's painting from her book. Master copies is a great way to learn, and I always learn a lot when I copy paintings I admire. 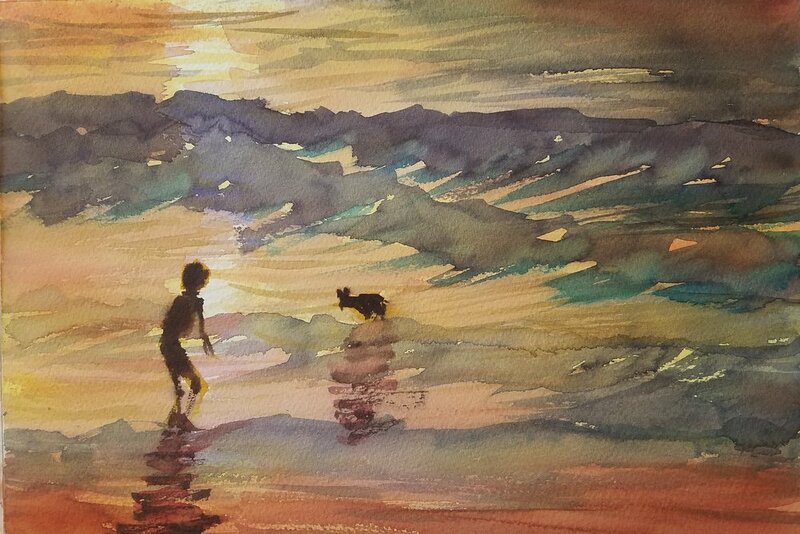 The idea is not to make an exact copy, but is to make a study of the painting and make mental notes on the learnings while creating the study. 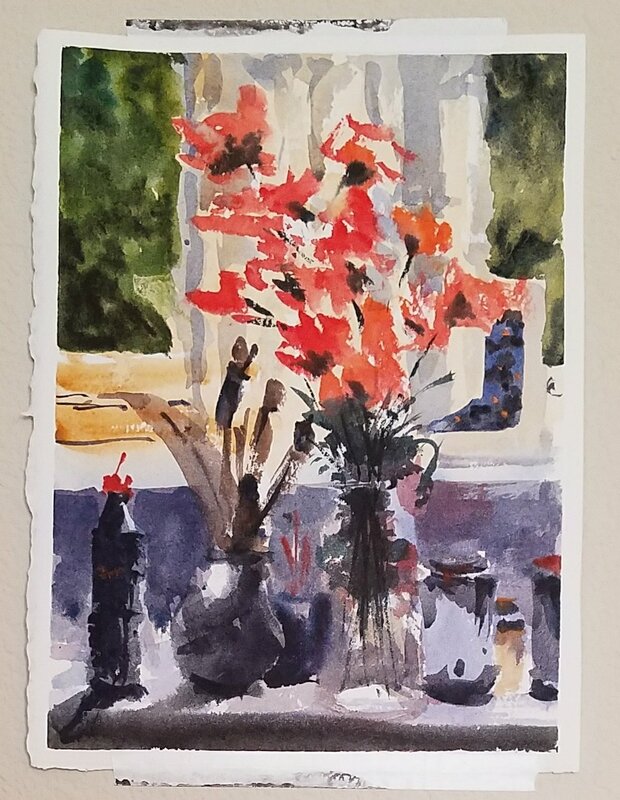 Today's master study is a copy of John Lidzey's "Flowers in the studio". I found this painting while looking through Hazel Soan's Flower Painting Workshop book. For tomorrow's study I want to repeat the same painting but with a little Tom Hoffmann thrown in, i.e. paint the shapes first and think about how much farther in the painting process do the elements need to be seperated. It has been a week now since I returned from the workshop, but the glow hasn't faded yet. Admittedly, I had never been to Mexico before and never taken an on-location workshop before, this is my first such experience and nothing to compare it against ... but it is without doubt the most magical one week of painting for me since I started this journey three years ago (more on that a bit later). In this post I will write about the wonderful place that is Melaque, and the people that make it so. Thanks to Laurie for most of the pictures in this post. Melaque is a combination of three beach front villages - San Patricio, Melaque and Villa Obregon, the entire area commonly referred to as Melaque. As far as I could tell tourism is the most important component of the economy of the area. Apparently Melaque is a popular beach vacation destination for Mexicans. The area has some ex-pat population (mainly from Canada surprisingly), some tourists from US and Canada but not too many. It is most definitely not a resort town like Cancun or Cabo. Here are a few pictures of what the town looked like. One thing you will notice in all the pictures are the wonderful shadows! This place is a painter's paradise. The place is small enough that you can walk the entire stretch on foot. There is an unbroken stretch of walkable beach that goes all the way from Melaque, via San Patricio to Barra de Navidad. Along the way you will find the beach front dotted with shacks, restaurants and bars (that didn't seem to have walls on the front and back, except for the two walls on the sides to hold up the roof of the shack). I am told that the water in most of the stretch is too rough for good swimming, but apparently great for surfing! Most of us stayed at the lovely oceanfront boutique resort in San Patricio, La Paloma. It is located right on the beach with amazing views of the ocean from most rooms. The place really is as beautiful as in the pictures. View of the ocean from Room 10 of La Paloma. You can see the pool on the left and Albatros Bar on the right. Also, palm trees everywhere! View of the beach from La Paloma. Man feeding his catch to the birds. The resort is gated, and once you are inside it feels like a sanctuary (high-walled hacienda!). It is beautifully designed, lovely landscaping throughout and is always cool because of the breeze from the ocean. The guests are welcome to enjoy the entire property, and there are lots of little nooks everywhere for us to gather. There were tons of options to eat out, and every meal was absolutely delicious. There are restaurants and eateries all over the place, ranging from tiny pop-up shacks to restaurants catering to the ex-pat community featuring hamburgers and salsbury steaks. My favorite meals are the ones we ate in the tiny pop-up restaurants with street seating. As evening rolled-in it seemed like every other home turned into a pop-up restaurant, serving tacos, sopes, pazole etc. You really didn't have to spend much money to eat a great meal in Melaque. At this place above, dinner for a group of 8 came to 235 pesos, which is equal to less than $15. The restaurants varied widely in pricing, and there were places where we spent as much as $10 per head for dinner and drinks but these were really lavish and luxurious restaurants. So yeah, things don't cost much here. This is a small town and all they have is Food. They don't have vegetarian, vegan, gluten-free, kosher etc. etc. If you have special dietary needs, best make your own arrangements. One thing for sure is that there is a certain sense of freeness that we have come to forget here in the US. Children play freely in the streets, stop and talk to strangers, watch us paint, all the while there is no parent helicoptering and monitoring the child. People stop and chat with you (if you speak the language anyway) in a leisurely manner with no sense of hurry. It is like when you are there you just forget to hurry. Everything is leisurely and laid-back. Everything closed down in the afternoon, the streets desolate, most storefronts shut and the town came back to life in the evening with music (music was everywhere! ), children playing in the streets, pop-up restaurants outside every home it seemed like, people set their chairs out on the sidewalk and watched the passers-by and chatted with their neighbors. Upon my return, when I was telling a colleague at work about this experience they said, "You didn't go to another place, you went to another time!". And that is absolutely true. It really was more like time travel. There were no smartphone-people walking on streets like zombies, there was little hurry about places to be and things to do. It was a therapeutic experience, a glimpse of enjoying life and finding happiness outside of "stuff" and "success". Its been a long hiatus since I last posted. The main reason for that was the Tom Hoffmann's Melaque Workshop that I was part of (I am in the process of writing blog posts about this workshop, stay tuned). Between recovering from the workshop I taught and getting ready for Tom's workshop, I just didn't have enough mental space to write. Now that all that is behind me, I am trying to get back into my sharing mode. This week I am painting florals in preparation for the Floral and Still Life workshop that I am taking this weekend. I am looking forward to seeing Mike Kirschel, who was my first art teacher, a wonderful artist and teacher who has since relocated out of this area. The workshop is actually in oil/acrylic but I am going to be bringing watercolors. Mike doesn't let the medium get in the way of teaching making good art, and I really appreciate that about him. 1. Strong composition with hard and soft edges, fuzzy wet-in-wet shapes juxtaposed with sharp, gestural marks with the rigger are the most important aspects of Fabio's painting. This is probably the trickiest thing of all, as it is mostly about developing the intuition about which marks are most fluent and make those decisions quickly while the paper is still wet. 2. He claims he works wet-in-wet entirely, and I have been trying to figure out what enables him to paint in this manner. One thing that I learned is that when painting wet-in-wet, using flat brushes is most helpful because they carry less water and less likely to dump a whole bunch of water on the paper causing blooms. 3. To get the kind of luminosity and lightness of Fabio's florals, I think we need to use transparent pigments. Also since we are painting completely wet-in-wet, it is important for these pigments to be low staining as well. I did a few attempts today, and these two are the most successful. Still, they are a good way to push the paint around during days when time is at a premium, and hope that the practice will amount to something some day. Today I went out to Alviso, which is just a mile or two from home. My intention was to paint the marsh at sunset, but I got distracted by this beautifully lit Mexican restaurant on the way. I parked the car, set myself up on the sidewalk and went to work. Tomorrow, I will take a picture of my new sketch kit and setup. The new setup worked out beautifully and it was very compact (well, compact in comparison to my watercolor easel that is, not in comparison to my sketch kit). Well that is all I will say for now. Tomorrow I will do a better job of taking pictures of the process and also the setup.